– A few years back we made a big push with Rocket 7 custom shoes and it was a fun project though it was doomed from the start since finding comfy shoes is a more complicated affair even than settling on a new saddle because, for starters, you have two feet to make individually happy. Compounding the problem was Rocket 7’s infinite customization options -- the number of ways to find displeasure was myriad. Rocket 7 is now out of business, primarily due to waning interest on behalf of its owner (not because the product was anything but blissful) and it’s ironic how many of them are still in circulation on PRO feet (and non-PRO feet). 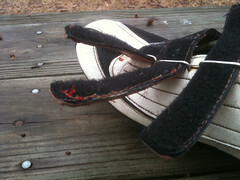 Mine are 4 years old and the wear & tear got worst in the least technical way imaginable: The Velcro died. It lost all of its stickiness so I made the mistake of taking them to a local cobbler and rather than unstitch the old Velcro they decided to stitch a new layer onto the old, making my beloved shoes heavier, sloppy-where-they-once-looked-handmade, and worst of all the newly-thicker straps became inflexible & too-tight to slide through their anchoring buckle. If you, too, love your old Rocket 7’s, be careful with what you inexactly ask for because you might get it. Here are some alternative options to the local. Twenty four dollars and 50 cents, I bought a footache. My ‘repair’ experience got me thinking about how the cycling shoe marketplace is a much different place than what it was just a few years back. There was a time (which seemed to last forever) where Sidi ruled with an iron fist and every other brand out there was a distant second. If you cared you wore Sidis and there wasn’t much of a debate on the topic. In the intervening years, though, Sidi has been knocked hard off their royal perch. Specialized in particular has slowly-but-slowly become the new dominant player -- based partly in the fact that their high-end shoes are quite well-done, the other element being the enslavement of their dealer network to Specialized-branded soft goods. Shimano shoes, too, are a huge player in the market. According to the last VeloNews reader survey (I’m doing this from memory…) Specialized and Shimano account for something like 70% of the high-end market. There’s still a small faction of folks who still think Sidi is king, but they’re the dinosaurs and it appears that there’s considerably more people out there (probably who’ve come to the sport in the last 5 years) who barely know who Sidi is, and who think Specialized Body Geometry is the cycling equivalent of Nike’s waffle iron and aren’t familiar with the heritage of Sidi and the consistent loveliness & fit of Italy’s finest. Whether you’re talking about Rocket 7 or Sidi, the artsy-craftsy family-owned shoe brand looks is getting increasingly marginalized in the marketplace and it’s for all the wrong reasons. – Hand me any bike you want and let’s go racing -- alu, Ti, carbon, whatever. My days of freaking out about my bike are done. Ditto on the diet. And training means ride a lot and make most of it hard, thank you. 2010 is a year for different obsession(s): My shoes (I’m screwed, see above), my glasses (let’s discuss another day), and my watch. My grandfather’s battered Longines about which I know very little (such as: Is it waterproof?) But I look at it and I’m overcome by a sentimental tidal wave of early modernism. Anquetil, Gimondi, Motta, et al. 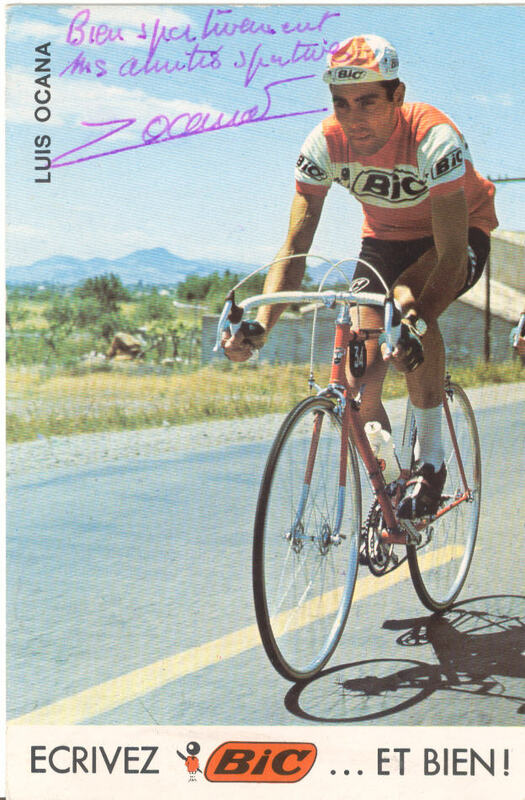 The Merckx-and-earlier era about which I need to learn more -- my Longines connects me to that bygone glory. It’s official team kit for me. – Whether you like The Lance or not, this is an undeniably sweet photo. (1) An awesome visual history lesson from Cyclocosm. (2) The Pavé blog’s thorough team-by-team breakdown of the 2010 ProTour. We wouldn’t have put SaxoBank even in the top-5, much less #1. (Did they even do the Belgian races this weekend?) That’s just opinion, though. What’s important is the amount of work (and love for the sport, obviously) that went into this report. – We’ve talked about rumble strips before. Traffic safety data shows they save lives so, as cyclists, bitching about them is short-sighted. But they’re becoming more than just an inconvenience -- they’re taking a bite out of the domestic race scene. – Every day that passes where the big bike industry players (i.e. Trek, Specialized, Cannondale) don’t make their wares available online (either through online retailers like Competitive Cyclist, or consumer-direct through their own websites) is another day where they are out of step with the consumer marketplace as a whole. Through their hesitancy they prove overly deferential to their dealers, and likewise they prove deaf to consumer expectations. Word on the street is that all the big players (named above) have their warplans for going consumer-direct written & ready to execute. But it’s a game of chicken to see who goes first. If it’s Trek, then Specialized can try to steal dealers by accusing Trek of abandoning them by going direct (or vice-versa). It’s a petty game that disregards the necessary building blocks for long-term business health & equally disregards the convenience and expectations of the bike-buying public. That being said, one of the bigger brands that have hitherto pooh-poohed online distribution is starting to show a reversal. Perhaps you saw this promotion from the Garm*n team, which is relevant here specifically because Felt has always forsaken online sales ’til this. The fine print makes it clear that this is indeed Felt’s inaugural journey into allowing online sales for their bikes: ‘It’s our first priority to make sure that you get the bike that you want, one that you can grab and go with minor assembly at home….It’s our goal to have your bike built and shipped to your door 7-8 days after you place your order.’ Now that Felt has dipped their toe into the dark side, we wonder who’ll be next? – The sappy, soft-lit, hagiographical up close & personal horseshit coverage of the Winter Olympics was fortunate insofar as that a scant 10 minutes of it delivered me from temptation to watch any more than that. The anti-NBC is the Belgian network Sporza, as shown by their online coverage of Kuurne-Brussels-Kuurne. In the heinous, apocalyptic rainstorms that begot an extraordinary day of suffering and courage we got pure race coverage and an undramatic recitation of just the facts, ma’am. (Not that I understood the play-by-play, but tone of voice tells all.) If any sport deserves ooey-gooey lyricism beside-the-fireplace, it’s the misery of the early Classics in Belgium. Thank goodness, that’s exactly what we didn’t get.